This hot and spicy sauce will tingle your palate. 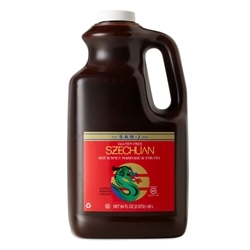 The complex combination of wheat-free Tamari, spices, ginger, plum and sesame gives San-J's Szechuan Sauce a balanced heat. This certified gluten free sauce is perfect for putting a new twist on your favorite chili recipe or stir-fry. For a tasty party snack, coat Buffalo wings with Szechuan Sauce and bake or grill. Even morning meals can be more exciting - add a drizzle of Szechuan to your scrambled eggs for a spicy kick.